Re: From 2006 -- Beadman Post Reply Edit Forum Where am I? Both the Bakelite Corp and numerous European firms (and probably some other US ones that Baekeland sued) were making cast phenolic resins before 1926. All of Bakelite's products were called Bakelite, not just the more industrial, filled and press molded compositions. The cast resin products were a "small" part of the Bakelite production, but not that much material, poundage-wise, would have been needed to make a LOT of beads. The information you had from 2006 and earlier was a good start but incomplete. I repeat my debunking of 1926 as some sort of milestone date for dating phenolic beads. 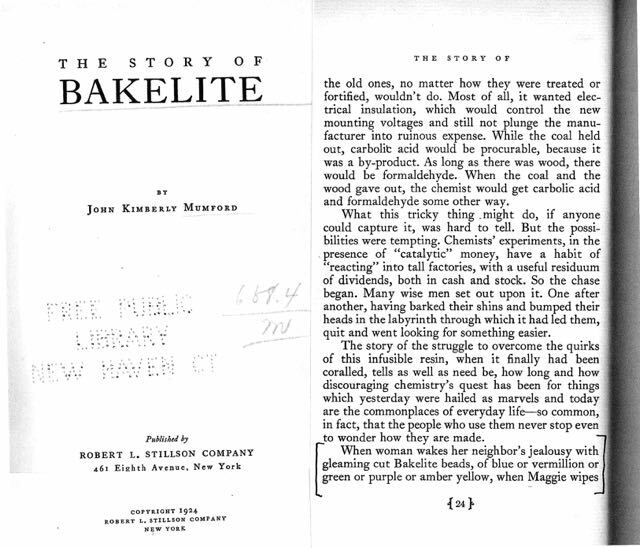 Here are excerpts about the Bakelite cast resin products from two of the references I used in my research. They both are from 1924 and it would not be much of a stretch to assume the products were available for a number of years before. My 1923 chemistry text for instance talks about cast phenolics for imitation amber as if it was an established product for all types of applications, including a specific mention of beads in several places. 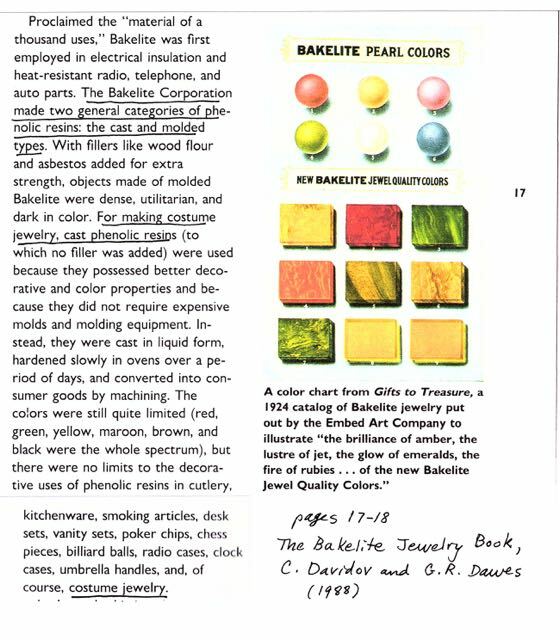 From 1910 to 1930, cast phenolic resins were being made and used as faux amber as well as in other colors, for beads & jewelry, by the Bakelite Corp and a number of European firms. The earliest mention of European cast resin for imitation amber (that I have found so far) was in 1913 for the German product Faturan. After 1930, in the US, the Catalin Corp. became the dominate maker of cast phenolic resin due to the Bakelite Corp discontinuing its product lines in 1929 (per Fortune Magazine March 1936). That's my perspective and I welcome the opportunity to change it upon discovery of more data.